Chart No. 3 - Sacrum Distorted Laterally with a Crease in the Tissue on the High Base Side, and a Compensatory Spinal Curve Opposite. 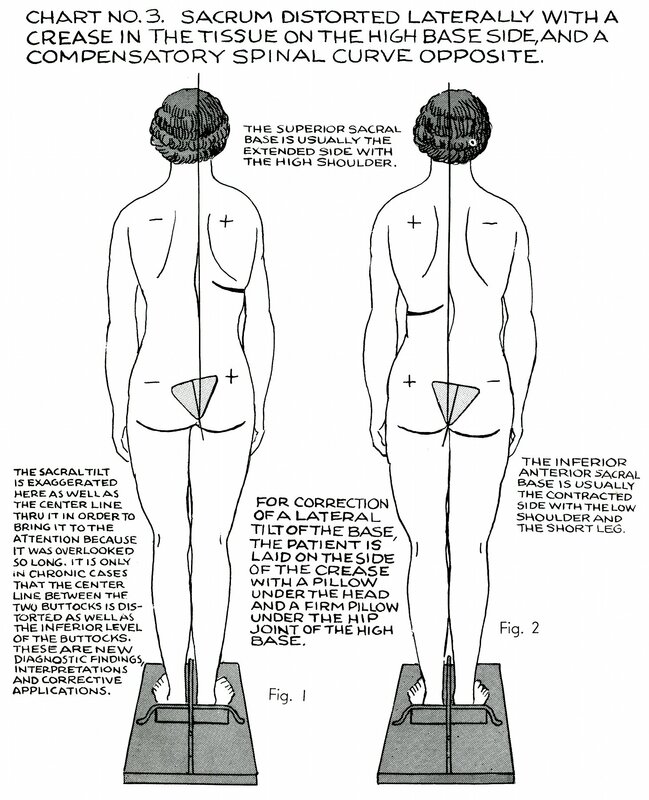 The superior sacral base is usually the extended side with the high shoulder. The inferior anterior sacral base is usually the contracted side with the low shoulder and the short leg. The sacral tilt is exaggerated here as well as the center line thru [through] it in order to bring it to the attention because it was overlooked so long. It is only in chronic cases that the center line between the two buttocks is distorted as well as the inferior level of the buttocks. These are new diagnostic findings, interpretations and corrective applications. 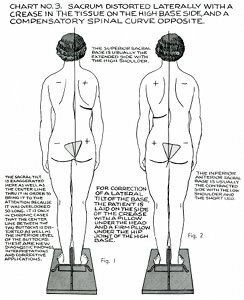 For correction of a lateral tilt of the base, the patient is laid on the side of the crease with a pillow under the head and a firm pillow under the hip joint of the high base. Book 4, "Explanation of Chart No. 3"